Meatballs with Hidden Veggies Mama Say What?! | Mama Say What?! My son loves the kid’s meatball sub sandwich from Firehouse Subs. Which I find funny because when I make spaghetti with marinara at home, he says he doesn’t like tomato sauce. He even prefers pesto sauce on his pizza instead the the typical tomato-based sauce. But for some reason, in a sandwich form with melted provolone on top, he devours it! Since he requested meatball subs for dinner recently, I figured I’d give them a try. Knowing he wouldn’t eat the green salad I planned to serve with them, I went looking online for Italian-style meatballs that included some hidden veggies. The results did not disappoint. Below is what I made. I adapted the ingredients and proportions from a number of different recipes and made my own since we don’t buy pre-packaged Italian breadcrumbs or Italian seasoning. I was really happy with how it turned out, and my son approved! To this day, he cheers whenever he finds out we’re having meatballs for dinner. 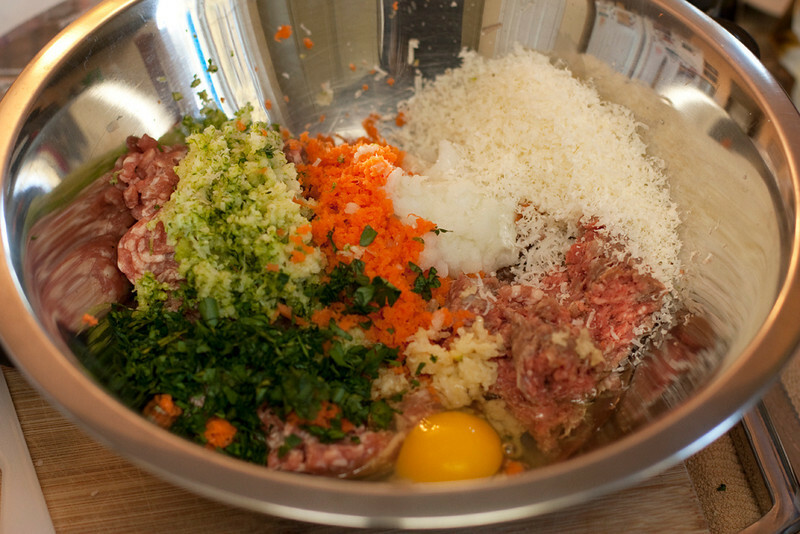 In a bowl, add the meat, carrot, zucchini, garlic and parsley. To get an exceptionally fine grate on the veggies, I use my Microplane. Also, if you don’t have fresh parsley, you can use dried. Just add it with the other dried herbs, as explained below. I really prefer the taste of fresh parsley with these. Add the onion, egg, and Parmesan cheese. Sometimes I will puree the onion in my blender if my son has been picking onions out of stuff lately. 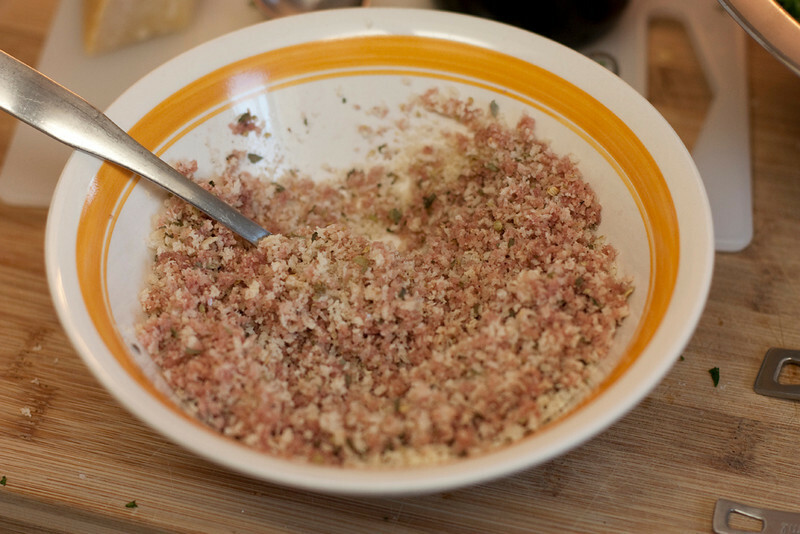 In a separate bowl, lightly mix together the Panko breadcrumbs, salt, pepper, oregano and basil. If you want to add any other dried herbs, add them here. Add the red wine to the breadcrumbs and lightly mix with a fork, encouraging the breadcrumbs to soak up all of the wine. Dump the breadcrumb mixture into the bowl with the other ingredients. Gently mix everything together with your hands (no other tools will work as well, promise!). If you’re making these ahead of time, go ahead and cover the mixture and let it sit in the fridge. You can make these a day in advance if you’d like. To make sure they are properly seasoned, grab a small chunk and throw it in a frying pan to cook. Taste and add salt and/or pepper as needed. When you’re ready to cook these, turn on the broiler on your oven. Line a cookie sheet or sheet pan with parchment paper. 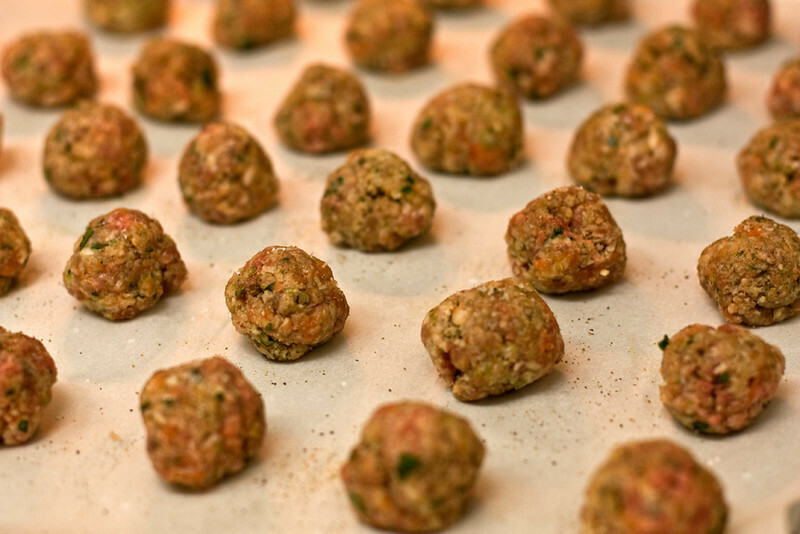 Using a spoon, make meatballs that are about 1 tablespoon, about the size of a ping pong ball. I actually use my tablespoon for this and then gently roll them between my hands and lay them on the cookie sheet. Sprinkle a little salt and black pepper over them all. This adds a tasty crust when they are cooking. Broil for approximately 10 minutes. Everyone’s broiler is a little different, so watch them carefully so they don’t over-cook. For dinner tonight, we served them on rolls with a few spoonfuls of marinara sauce that I made over the summer with homegrown tomatoes and canned. Then we topped with some fresh mozzarella cheese and stuck them under still-warm broiler for a couple of minutes to melt the cheese and toast the bread. They turned out so delicious! These meatballs can also be served with marinara sauce or any kind of sauce with pasta, polenta or mashed potatoes. My oldest will even eat them with steamed rice. This recipe can be doubled or even tripled and the meat stored in the freezer. 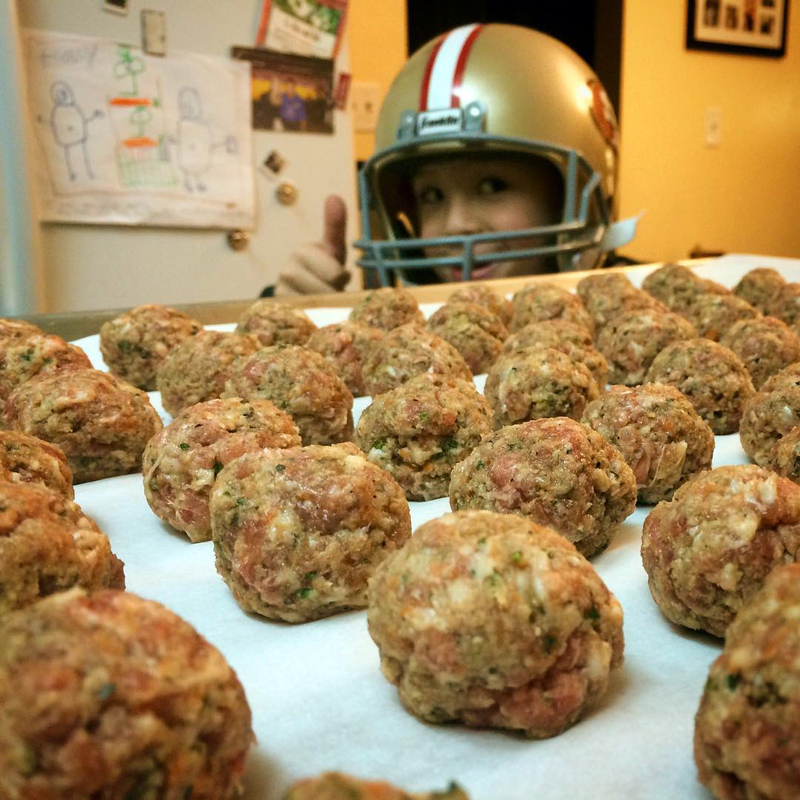 You can pre-form the meatballs and freeze, or just freeze the meat mixture in a zip top bag or vacuum-sealed bag. For a gluten-free version: Use some sort of gluten-free breadcrumbs. I made a batch for a friend by grinding up some gluten-free bagel chips in my blender and then treating them the same as Panko breadcrumbs. They turned out delicious! You can also lightly toast or dry out gluten-free bread and crush to make breadcrumbs. 1. 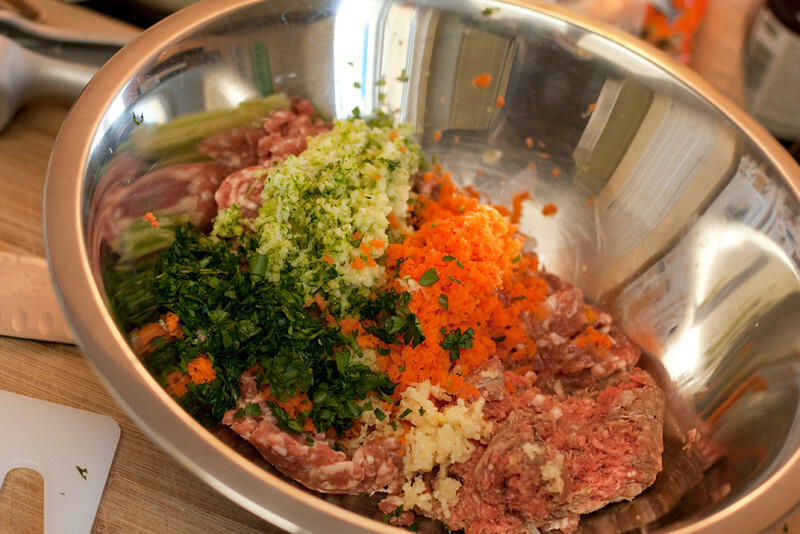 In a bowl, add the meat, carrot, zucchini, garlic and parsley. To get an exceptionally fine grate on these veggies, I LOVE to use my Microplane. Also, if you don’t have fresh parsley, you can use dried. Just add it with the other dried herbs, as explained below. I prefer the taste of fresh with these. 2. Add the onion, egg, and Parmesan cheese. 3. 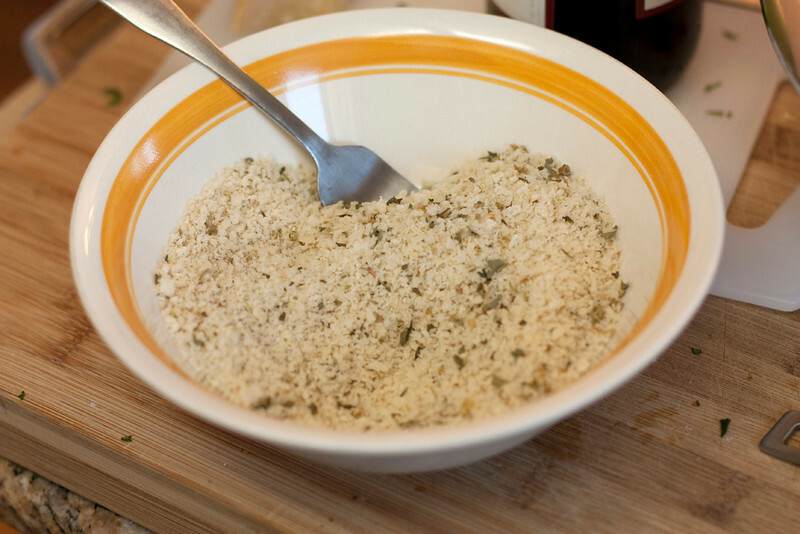 In a separate bowl, lightly mix together the Panko breadcrumbs, salt, pepper, oregano and basil. If you want to add any other dried herbs, add them here. 4. Add the red wine to the breadcrumbs and lightly mix with a fork, encouraging the breadcrumbs to soak up all of the wine. 5. Dump the breadcrumb mixture into the bowl with the other ingredients. Gently mix everything together with your hands (no other tools will work as well, I swear!). 6. If you’re making these ahead of time, go ahead and cover the mixture and let it sit in the fridge. You can make these a day in advance if you’d like. 7. When you’re ready to cook these, turn on the broiler on your oven. 8. Line a cookie sheet or sheet pan with parchment paper. 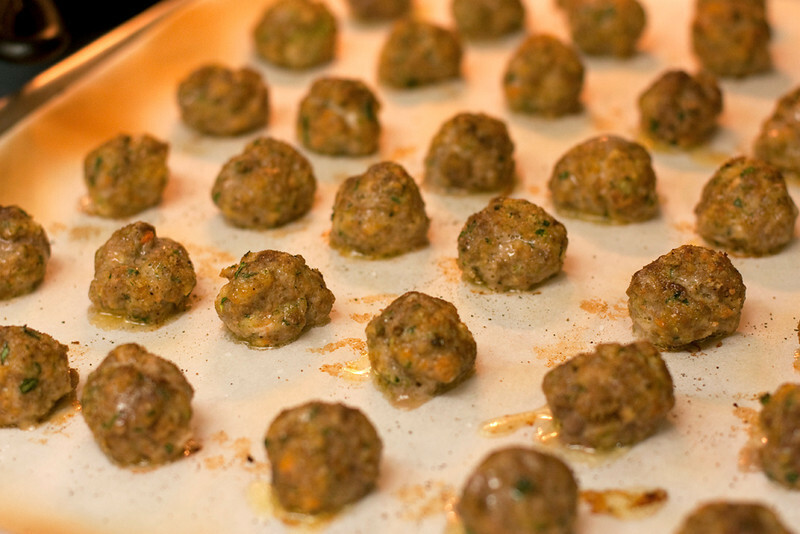 Using a spoon, make meatballs that are about 1 tablespoon, about the size of a ping pong ball. I actually use my tablespoon for this and then gently roll them between my hands and lay them on the cookie sheet. Sprinkle a little black pepper over them all. 9. Broil for approximately 10 minutes. 10. Serve however you’d like! 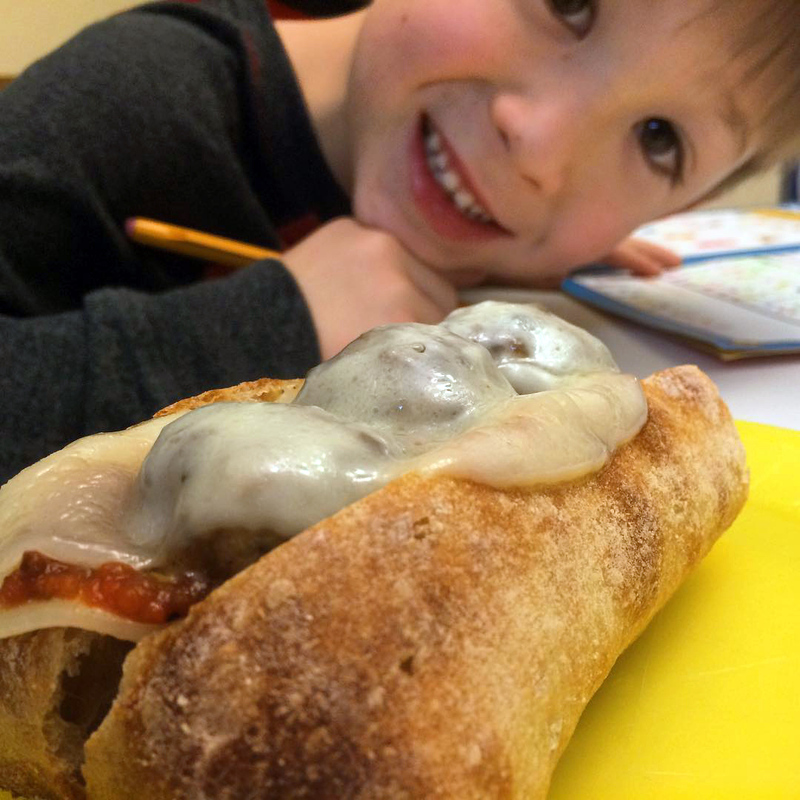 We often do meatball subs with marinara and provolone cheese. Sometimes we do bowtie pasta with pesto, sometimes we do minestrone with meatballs. Some days my son would be happy with just meatballs and steamed rice. These meatballs can also be served with marinara sauce or any kind of sauce with pasta or polenta. 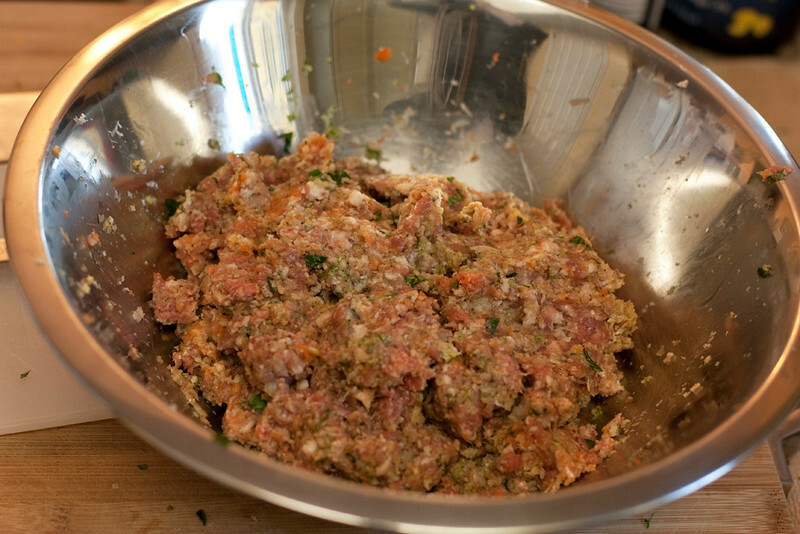 This recipe can be be doubled or even tripled and the meat or pre-formed meatballs stored in the freezer for later use. Added by Alex T. on February 21, 2014. My Italian grandmother would be rolling over in her grave if she heard me admit I buy meatballs premade. This recipe looks good…going to have to try it! I always try to find creative ways to hide veggies so my daughter can get her some for the day. 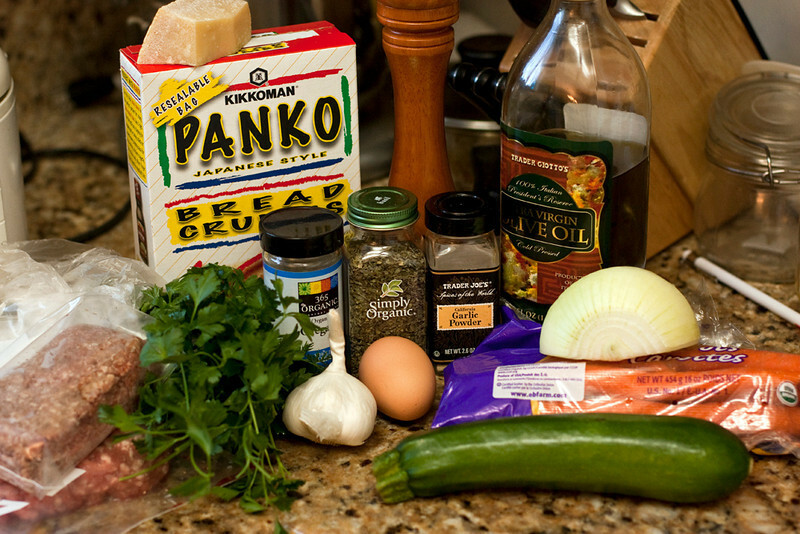 Pingback: TJ's Hidden Veggie Minestrone Mama Say What?! | Mama Say What? !